Each summer, Tespa invites collegiate leaders from across North America to unite at its Summer Retreat. 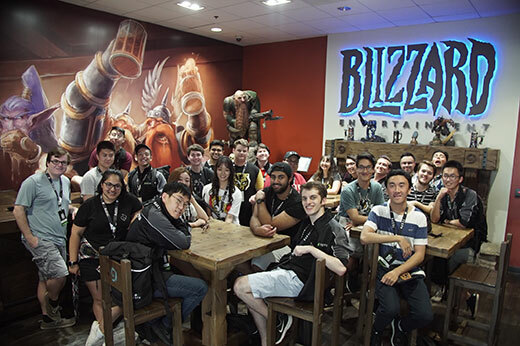 This year’s Summer Retreat saw twenty-four of the best and brightest in college esports come together in Irvine to achieve personal and professional growth. The Retreat is an esports opportunity like no other, giving attendees three days to collaborate on best practices, develop leadership skills, and team up to both discuss and prepare for the biggest challenges in gaming and esports. By week’s end, these attendees departed equipped with newfound expertise and a confidence reflecting their ability to take their college esports scene to the next level. Priority number one at Summer Retreat is empowering leaders to face the challenges of the esports industry. 2018’s retreat focused heavily on developing leadership skills, community building, professional development, competitive planning, and strategic partnerships. Students learned from university esports directors and listened to stories from experts in the field. In addition, these students also shared their personal efforts with each other and with Tespa. Hearing their stories and their aspirations for the future had a powerful impact on everyone at the event. While managing a college gaming club can be hard work, it can also be a lot of fun. Student leaders at retreat had the opportunity to practice some self-care yoga and also get to know their peers in a more casual setting, providing them great opportunities to build new connections and relax with fellow leaders. Everyone at Tespa HQ would like to thank our Chapter Leaders for both bringing and sharing their passion and enthusiasm with everyone at the retreat, including ourselves! We hope each and every one of our student leaders enjoyed themselves as much as we did (it sure looks like they did). Seeing the talent and determination of these up and coming leaders filled us with excitement and confidence for the future of college esports.